Find peace, connection and heartfelt joy in everyday life. "The happiest people I know savor life's joys and delight in simple pleasures.... They attend to the moment, live mindfully in the present, and are full of gratitude for life. They anticipate the future, but also relish the small gifts that each day may bring: stopping to watch the sunset, gazing at the full moon overhead, lingering over warm coffee or tea in the morning, enveloping a child in a hug. With their lives, they teach us: Enjoy the little things, for one day we’ll look back and realize that these were, in fact, the big things." 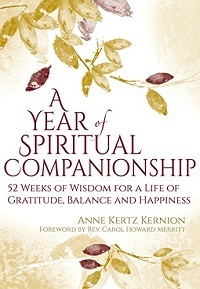 In this week-by-week guide to living more thoughtfully, Anne Kertz Kernion leads you through an exploration of everyday spirituality, combining the wisdom of spiritual luminaries, life lessons, and insights from social science and neuroscience. A businesswoman, wife, mother, grandmother and friend, Anne shows how it is possible to bring more awareness, love and gratitude into your busy life, keeping in touch with your deepest beliefs and most authentic self.